Republic of Ireland boss Martin O'Neill was happy to make a winning start to the Euro 2016 qualifiers after a 2-1 victory over Georgia in Tbilisi. 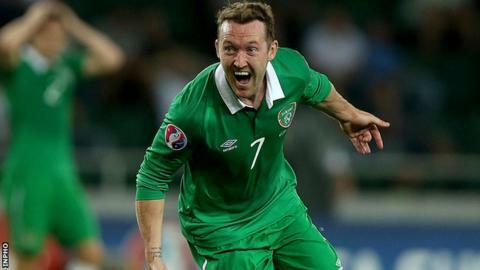 Aiden McGeady scored a brilliant winner in the final minute to ensure O'Neill won his first competitive game in charge of the Republic. "It was a great win for us - I couldn't be more pleased and the boys are delighted," O'Neill told RTE. "The winner was a stroke of genius from a really gifted footballer." McGeady put the Irish ahead but Tornike Okriashvili levelled before the Everton winger completed his double with a brilliant last-gasp strike. "We were all questioning his goals ratio for the Republic but he was the only player on the field capable of scoring that goal," added O'Neill. "I thought the game had gone beyond us and the last thing you want to do is to lose the match in the last minute of two but suddenly, there was that genius." O'Neill admits there is room for improvement as he plans ahead for qualifiers against Gibraltar and World Cup winners Germany next month. "We controlled the game although we didn't make the most of our possession and that's been an age-old problem for the Republic of Ireland," he said. "We gave away a sloppy goal which put them back in the game. "There were moments in the second half when we had to defend strongly. It's away from home and other teams have to come here and win matches. "I'm delighted - we have three points on the board although we can improve."